Mysteries: Who? What? Where? When? Why? So tell us a mystery that could be the start of an ARG or an assignment or project that you could give to students or learners. Feel free to respond before this session or after it. This is a short mystery project, I give the students a photo, it shows a gathering of lovely young women, in what looks like a picture taken at a dance, there is an emblem with Greek letters in the background, there is no date on the photo, everyone is dressed formal, there is a band, there is no location on the photo. In this case it is all internet research and collaboration in the classroom to tell what, where and why the picture was taken. All the people in the photo are Black Americans and mostly are young women. It took them about an hour with all of them collaborating to figure out it was the Alpha Phi Chi Beautician's Sorority established in 1923, taken about 1950 in Denver at the Rossonian Lounge, near what is called "Five Points" in Denver. The clues were all in the photo. 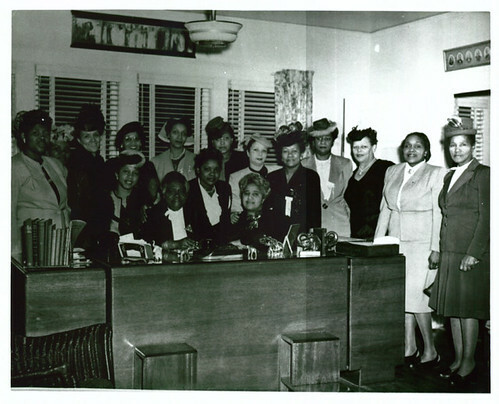 Here is a picture of the founder, Mary McLeod Bethune with some members. How could you use this as part of your mystery? That's pretty cool, a project like that where all the students are collaborting with their computers would be a fun way to do on-the-spot research. @Hawkye, I actually expanded that some because I had a woman's hat (including the original hat box from a Denver store) from that era, had an artificial corsage, had a man's tie, had a couple of records (old 45s), I even had a bottle of Tabu perfume (THE perfume of that era) and copies (from an eBay sale) of Denver Bears tickets with the date blacked out. Ha, still took them an hour. . .
A second one was a big box of personal papers of a man who had died in the 1970s, it was everything from birth certificates through military through pay stubs, etc. It had been thrown into a dumpster at a house cleaned for sale. They reconstructed his life with dates, medical records, got some kind of a kinship chart, and actually found his death record and where he was buried on the internet. It had receipts for gas and food to turn in for reimbursement. They love that one. It also got returning veterans in the class to interact to look at the military records to help figure it all out. They even located the insignia that would have been assigned to him. Alas, no photo and we could locate none on the internet. Did find obituary. Grasshopper, I really like your "rabbit holes" and "trailheads". How authentic and engaging! What were your learning goals? It sounds like general creative and critical thinking/problem solving, but I can imagine something like you described with history learning goals specific to a particular figure or event. Where: "Science City" is hands-on science center designed to resemble a city, with streets, underground sewer, and various "establishments" that house particular kinds of science activities, such as the Crime Lab. What: Something has happened in Science City. The citizens are no longer interested in science at all. They've stopped asking questions and making predictions. They've stopped looking for evidence on which to base their conclusions. In fact, they've all started laughing uncontrollably. The Town Sheriff identified and marked what he thought might be clues to the solving mystery all around the city. But alas, before he could analyze them, he was lost to an incessant fit of laughter. Likewise, before the Mayor herself succumbed to the laughing affliction, she recorded a plea for assistance she hoped would reach any visitors to her besieged municipality. Anyway, that's about as far as I've gotten. The trouble is that I want the game to encourage the kids to interact with the exhibits from an inquiry-based p.o.v., not just leave clues and QR codes around the museum for them to collect and decipher. The Crime Lab exhibit is one of the best inquiry-based exhibits, so that spawned my "solve the crime" approach, but there are many other exhibits that aren't so easily worked into a narrative such as this one and ultimately "gamified". Now, I'm considering a hybrid kind of game in which the mystery I described is running parallel to a more straightforward science challenge kind of game in which the visiting student groups are divided into two teams and the goal is to see which team can get the most points for "solving" the challenges and puzzles at various exhibits. Maybe some of the Games MOOC folks have some ideas? I could really benefit from some other game-based brains on this one. This is a very entertaining idea. You seem to have put a lot of thought into it, and, even though you're fuzzy on a few parts, I have no doubt you'll be able to pull this together cohesively. Reality television show, eh...I always knew those Potatoville people were up to no good. Love the ideas here. Especially love the primary source mystery thing. You could also assemble primary source mysteries from documents obtained from the National Archives site or Library of Congress site about any subject or topic. It could all be done online using links to the artifacts but having the actual documents is always cool. @DeeLynn, you are thinking far ahead of me on this. One problem I have is I am at a community college and I really have problems with field trips, no busses, all is self-transport, and not that easy to get permission and the students have other obligations, family, work, etc. The goal in looking at the picture, and the "artifacts" were to really help them understand how archaeologists recreate the past from artifacts and to have them think about what it was like for Black American beauticians in the 1950s in Denver and the reason these self-help groups were important. it also opened up a discussion on "ethnicity and race" and we talked about the different needs for hair products for Black Americans and how that industry evolved to meet a need, and then talked about how beauty shops and barbershops became the hub of Black American towns and cities. Here is a link discussing the importance of Black beauty shops and barbershops. Heh, that article is both educational and amusing. It's interesting to think that hair salons became such a cornerstone of Black American identity. Also now I keep picturing Michelle Obama in an afro. I've put together a blog post that lists some free web 2.0 tools that I think could be useful in creating your own mystery game (or having students create their own): "DIY Mystery Game." I'd love it if some MOOCers could share tools they think could be bootstrapped for a DIY mystery. Technical difficulties aside, I really enjoyed the DIY: Mystery screencast. It made me think about all of the mystery games I've been playing and which ones kept me the most engaged and why. I did a little research on designing mystery games and found this great blog post: "Creating Mystery Games." 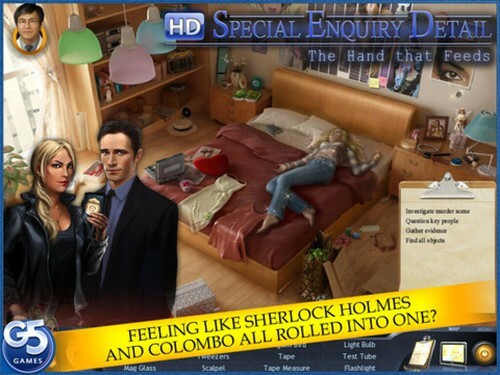 As I've mentioned, my all-time favorite mystery app has been Special Enquiry Detail. To me, it has all of the hallmarks of a good mystery game. I enjoyed the DIY Mystery Screencast. I love mysteries, currently I am watching all the Midsomer Murders [BBC] on Netflix. I love the whole clue thing. Next I am off to watch some of the old "Murder, she Wrote" ones, so simple but now that I am thinking about the creating a mystery for my class, I find looking at the way clues are laid out in "Murder, she Wrote," is helping me understand how to organize my own. I think I am really leaving a trail of breadcrumbs for them to follow. I have to admit my favorite mystery game is "CLUE" can't beat it for Mr. Green in the Library with the Gun. . . There was even a VCR Clue Video Game Clue VCR Video Game and of course now an iPad/iPod/iPhone and Android APP, have to give credit where credit is due that game as been around since 1949. Thank you for this Creating Mystery Games i will refer to it quite often.